CT Studios: Where do missing things go, and how do they get back ? Where do missing things go, and how do they get back ? 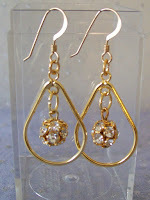 Back in January, I created a matching of pair of earrings, which I called Disco Balls. They were a remake of some other earrings I happened to find. Now, I considered these special only in that I do not typically make earrings. They are just so common, very little is involved and everyone makes earrings. But, these little beads were fun and special. So I made two; one to list in my Artfire shop and the other to give to my sister (because she is special to me). Well, I listed the one set in Artfire and the other set (for my sister) simply disappeared. I knew they were missing within a couple hours of creation. I looked everywhere. I mean everywhere; down the sides of the couch, and in the garbage ... everywhere. The next day, I even did some housecleaning in search. It's not that they are extremely valuable, but more than I had made as a gift which I was really wanting to give. Okay ... I finally decided they were simply gone; maybe one of the teenagers picked them up by accident (ya right), or they had hit the garbage, flushed down the toilet, whatever ... gone, and the search was discontinued. And then, yesterday, I'm in my studio and right there, in the middle of the floor, still in the tiny plastic bag, are the earrings. I'm think, okay, these are the ones in inventory listed in my shop. So, I rushed to the inventory box to check. Nope, they are are ... these are the lost earrings for my sister. Go figure that. How did the get in the middle of my studio floor? These little mysteries in life are just confusing.